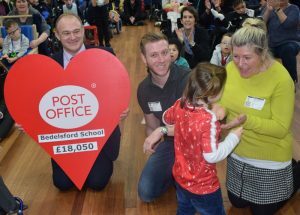 We were delighted to welcome Sir Ed Davey MP and Sheila and Gian from the Post Office to our school to present a cheque for over £18000 raised by the Post Office. Gian is the Uncle of one of our pupils and nominated the school – thank you Gian! Julia James, Principal of Bedelsford School, said: “We are extremely grateful for such a generous donation raised for the children of Bedelsford School which will have a significant impact on our pupils. It will allow us to refresh our sensory garden and adapt it to to meet the needs of our current pupils who have sensory needs as well as enhance the learning opportunities for all our pupils.